Austria (Matt Sundstrom): 13, 49.706 points. England (Kevin O'Kelly): 9; 23.824 points. France (Chris Cantine): 0; 0.000 points. Germany (Ted McClelland): 9; 23.824 points. Italy (Eric Brown): 3; 2.647 points. Russia (AJ Roskam): 0; 0.000 points. Turkey (Nelson Flynn): 0; 0.000 points. McClelland, who joined our club in October 2008 and was the Rookie of the Year for Season Four, was playing his last game as a regular. He got married last weekend and will be moving to Boston later this month with his wife, who just took a job with Harvard. He hopes to take what he learned with us to the New England hobby. "I think I finally figured out how to play this game," he said as he was leaving. Offered his ally, O'Kelly: "I didn't want to stab him in his last game." Austria (Kyle Brintnall): 0; 0.000 points. England (Jim O'Kelley): 5; 6.345 points. France (Brad Harrington): 8; 16.244 points. Germany (Tony Prokes): 4; 4.061 points. Italy (David St. John): 17; 73.350 points. Turkey (John Ritz): 0; 0.000 points. Our featured game for the day, we played No. 250 in Eric's two-story library on the custom board hand-crafted by Peter Lokken. Play opened with a Sea Lion in the West. By 1903, I had lost Norway and Liverpool. In the East, meanwhile, the game began with an apparent A/T vs. R. Ritz played a Sundstrom against Kline. In Brintnall, however, Ritz found a cautious, even reluctant ally. Kline managed to pick up Rumania along with Sweden, and in 1902, he turned the tables on Austria and Turkey. While I put up a determined defense of the home island, Kline was being Kline in the East. He picked up two more in 1902, and another two in 1903. His war machine finally slowed in 1904, as he managed only single centers that year and the next. Early on, it looked like Kline might solo. He was growing in the North and East, Turkey was actively aiding him, and the Italians were so fed up with the Turks that they talked of throwing the solo as well. But by 1906, France and Germany finally backed off of me, and the three of us counter-attacked in Scandinavia. Italy also started rolling and began picking up Russian-owned centers and threatening Kline's Turkish breadbasket. St. John tied Kline at 10 centers in 1907. Around then, perhaps a turn or two earlier, we began the seasonal ritual of proposing draws. None was openely vetoed, but every one failed. I thought it was Kline, hoping that the Western alliance would fall apart and give him another chance to solo, or St. John, who needed a large board-top to crack the Royale field. Each was passionate in his denial, and they pointed fingers at Harrington, who briefly shot up to eight centers in 1909, and me, who was slowly clawing back into the game. Lots of finger pointing, but none at Kyle or Prokes. By 1909, the tide in the East had turned in favor of St. John, and Kline decided to back up his threat to throw the solo. With Kline's active aid, St. John exploded. To 12 in 1909, 15 in 1910, and grabbing St. Pete for his 16th in 1911. With the 9 p.m. deadline approaching, the Westerners scrambled to retake St. Pete and lock down the stalemate line. St. John took Moscow and Warsaw in 1912 to eliminate Kline, but we made the right moves in Scandinavia to capture St. Pete and seal the board. St. John settled for a huge board-top that vaulted him past Prokes into fourth place. Turns out that was fitting justice. Fitting because on the last turn of the game, while Prokes, Harrington and I coordinated our last desparate moves in the dining room, Prokes started chuckling. "I have a confession to make," he said. "I voted down every draw." I like to call him Evil Tony because of his goatee. Turns out he's Evil Tony because he's a sadist. 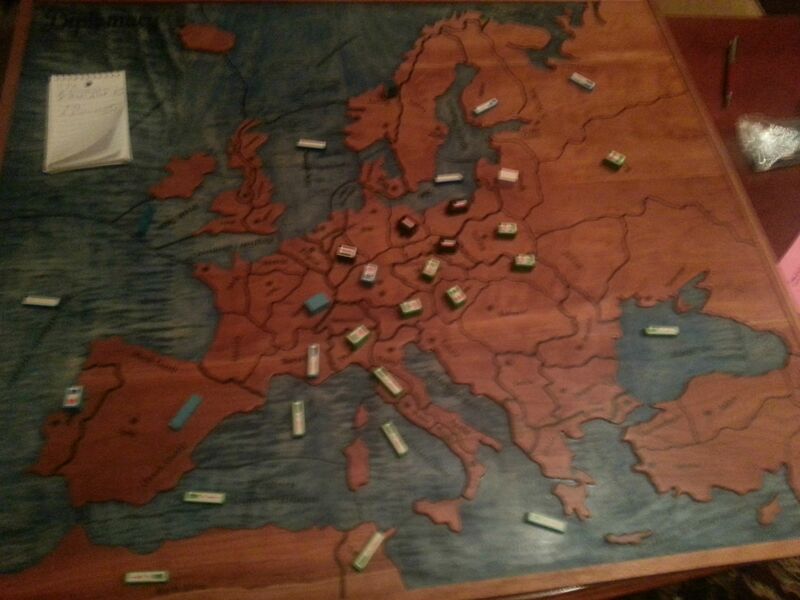 The third board, played in the family room, was the last to start but first to finish. It was also the only board that wasn't seeded by the Diplomacy Tournament Manager software. Instead, we put Dan Burgess on the board, as he was the second to last car to arrive, along with Peter Lokken and his passengers John Gramila and Jez Fordham, the last car to arrive. With them, we placed me and Prokes, as we were each playing on two boards. The final seat went to a volunteer who agreed to wait to play until the missing players arrived. That volunteer was Kevin O'Kelley. As it turned out, both cars arrived before the other games started. In fact, in Game 250, we were just starting to set up our board, so we quickly scrapped that and commandeered Lokken's handmade board. We were, after all, the featured game. Austria (Dan Burgess): 0; 0.000 points. England (Kevin O'Kelley): 7; 24.020 points. France (Jim O'Kelley): 6; 17.647 points. Germany (Peter Lokken): 5; 12.255 points. Italy (Tony Prokes): 7; 24.020 points. Russia (John Gramila): 3; 4.412 points. Turkey (Jez Fordham): 6; 17.647 points. "So you killed me and called the game?" Dan moaned afterward. "The result just seemed right," several of us retorted. Once Game 250 finally ended, host Eric donned his pith helmet and we began the awards ceremony, starting with the Weasel Pyle awards, handsome rosewood pens provided by Eric. In addition to the best country pens, Eric always provides five special pens. They were awarded as follows. Tenacious Stoat, for stubborn defense: Chris Cantine. (Chris was jumped by all three neighbors in Game 249, but he held out until 1906. The Tenacious Stoat his a bittersweet pen to earn because it usually means that you had a rough game. And wouldn't you know it, the pen disappeared before we could present it to Chris. Talk about tough luck. We then presented the Weasels and announced the Royale bids. And finally, at just about 10 p.m., we struck the Regimental Choir and closed another season of Windy City Weasels Diplomacy with the singing of our battle hymn, Come Now Weasels. Fifty-nine players, 31 boards, and another fantastic Weasel Pyle. Thanks, All, for making Season Nine such a great one. See you in September! Supply center charts are here. Unlike most of the other Italians I've ever played with, I opted for the slow opening, convoying to Tunis through Ionian and refusing to attack Trieste in 1901. With Turkey and Austria focused on Russia, I was able to convince them to let me convoy Tunis into Greece unopposed. I 'accidentally' slipped into Serbia in 1902, filling Greece with the fleet. Clearly my only intention was to make sure that the Austrian/Turkish attack on Rumania didn't accidentally leave Serbia as a Russian retreat. Clearly. Seeing this good fortune, I decided to shift a fleet to Adriatic and try for an attack on Trieste in 1903. This succeeded, but I lost Greece, retreating OTB to rebuild as an army. I believe this was the year that Germany marched two armies into the Alps, only to find that Russia had moved in behind to attack a defenseless Berlin. I might be off by a year though on the timing of the Russian stab against Germany, but whenever it happened I know that from my perspective it was nothing short of miraculous, taking the two German armies off my back. Almost as miraculous as the 'friendly' German visit to the alps was that after my cruel invasion of Serbia and Trieste, I managed to patch things up with the two center Austrian and hold ground against the now allied Russia/Turkey. This was not easy, especially playing short one unit in fall '04, having disbanded a dislodged army in Serbia with no retreat. Turkey couldn't hold Serbia though, and Russia completely sealed Turkey out of his home centers in 1904, taking him down to two units. Losing a dislodged/disbanded army was a blessing in disguise, since resurrecting it as a fleet became crucial. I should point out at this point that the Italian/French alliance really came into full bloom in 1904. Years of goodwill had bred enough trust that a French army was allowed to walk from Mars to Piedmont and then Tyrolia, destined to help retake Munich from Russia, without so much as a unit covering Venice. Meanwhile, an Italian fleet was moved casually into the Western Med to trap the rogue Turkish fleet in Tunis, without so much as a blink or an attempt to cover Spain. In retrospect, I realize that this alliance was the backbone of my entire game. In 1905 I continued to prop up Austria to hold back Russia and went after Turkey. It might not look like a big year on paper as I only picked up one dot. But by successfully eliminating Turkey and his rogue units, the balance of power in the Med was shifted permanently in my favor, and my four fleets became solid gold. The diplomatic situation was everyone against Russia, and this made my next three centers pretty straightforward - Bul, Con, Smy. It is almost impossible to hold these centers as Russia against a Mediterranean naval power, and certainly can't be done while occupied in heavy fighting along the whole front from Norway to Rumania. I honestly voted to approve every draw from the time I hit 10 centers onward. I played as slowly and 'nicely' as possible in 1907 and 1908 so as not to suffer Russia's fate. I was wary of being seen as a solo threat to the point of paranoia, figuring that if the board could be in a diplomatic state of everyone-against-Russia, that could flip on me on a dime. Well, to my good fortune, it didn't. In 1909 after at least 5 failed draw votes that I voted to approve, I decided it was no more mister nice Italy. With ten near-perfectly placed units poised from Tyrolia to Armenia (including an army sitting in what was then Austrian owned Serbia), I saw what I thought was a near 100% play for Vienna, Bud, Rum, Sev, and the 15 center stalemate line. So I abandoned any hope of having an ally on the board and went for it. I don't think Russia could have stopped me short of these 15 centers with any defense, although I could be wrong since I don't remember every single unit disbanded that could have been sent to stop me. But for all the times I lied to him, and all of his dots I grabbed, in the end Russia walked out of his home centers and made a valiant effort to get me to 18. England, Germany, and France had the stalemate line from Spain to St. Petes just in time, as Jim says, ending it with 17 Italian centers. A quick few comments about Game 249... yes it was true I sought Ted to work with him in his last game as a regular. We had figured we would go after France no matter what and we both went after Eric Brown as Italy to join in the fight. Eric was on board with only his army, but we figured that was all we would need. We were wrong... Chris played fantastic defense and was helped out by a terribly miscalculation on my part, leaving him an open BRE to build after picking up the open SPA after 1902. It took another 4 years to eliminate Chris, only after Italy threw 3 more units into the fray. For the rest of it, Russia was also jumped pretty good in the game, leaving Turkey all in during the war and also left hanging out to dry. Italy completed a perfect Lepanto and Turkey didn't stick around to read his Spring 1904 orders, only being left with a defenseless center. Not much he could have done for that. Russia was next. I came over the top for SWE and STP while Italy and Austria took SEV. Eventually we got WAR and MOS before the game ended. AJ was in a tough spot, had a very viable position until the very end and played another great game with us. Best of luck to him in college and hopefully finding a group in Providence or meeting up with Ted in Boston. As noted above, it was pretty level (9, 8, 8, 7, 2 I think, until Matt stabbed Eric for three and that led to our final scores. Matt could have reached 16-9-9, but Ted and I could have probably fought for a center or two in there, but we got to where we all felt the game was going to end. It was another great day at the Pyle. Thanks again to our host Mr. Brown and I look forward to #PyleX next year. For those that don't know Wilsonian... all negotiations are in public around the board. We set the deadlines at 3-minutes drop dead, although we rarely followed the time and I think I forgot to press start at least 4 times. The game moved though and I think we completed about 7 or 8 years, I think. Turkey got an unlucky break, misordering on an agreed upon swap of SEV for CON. Italy declared his intention for TYL in the first comment of the game, then wondered why I bounced him. Austria held the same position with the same 5 units for about 4 game years and eventually succumbed to the Russian attack when his Italian ally was distracted by a French attack and Germany permitted Russia to walk through. France was the large power on the board early in the game, but had stretched out. I stabbed for one to keep things even (which actually was a stab for 0 as I left a SC open for retreat), promised that it was only a stab to keep things even, then stabbed for two more with additional armies moving to BUR and PIC with no French armies back home. Gramila was already shooting the BB gun during the stab with French fleets in ADR and ION, so I think he was a bit distracted, but I'll take credit for the stab and position. England spread out early and France seemed to want him dead, throwing almost everything he had up north, resulting in defending home, but surviving to the end. That allowed Russia some growth up north and allowed him to focus almost solely in the south. He got to 13 steadily, but quickly (and finished with 15, I think), grabbed a few more as he stretched for a solo, and had a good play for 18. But a lucky guess from me in Scandinavia took 2 from him and POR couldn't be held, so we called the game after about 90 minutes and 8 years I think. Fun game with a lot of laughs.